FlameShieldä rectangular (Type I) and triangular (Type II) profile silicone rubber self-fusing compression tapes meeting various OEM manufacturer's and A-A-59163, Mil-I-46852 or Mil-I-22444 specification are used for a variety of critical electrical wiring and cable splicing and protection jobs. Especially suited for aviation and marine environments, as well as outdoor weathering environments. 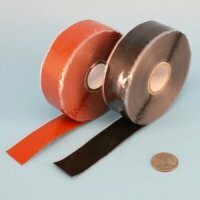 This tape is available in oxide-red and black colors - other colors are custom run. The triangular tape has a guideline stripe in the center which aids in achieving a 50% spiral wrap. Triangular levelwrap tapes provide a smooth surface on spiral wrapping, preventing the tape wrap area from snagging when pulling a wire or cable through a bundle or over objects or openings. FlameShieldä tapes meeting A-A-59163, Mil-I-46852 and Mil-I-22444 provide superior electrical insulation with a minimum of 300 volts per mil (.001") of tape thickness at 365°F / 180°C. 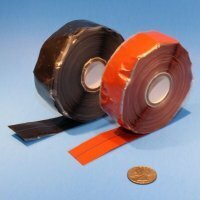 A 20mil tape therefore provides 6000 volts per wrap of insulation value. This tape is also used to wrap hydraulic connections and to make vibration resistant bumpers and spacers for wiring, cable, hose, pipes and lines. This tape is used to wrap and hold insulation in place on hot air ducts.